Looking to take a break from processed sugars? 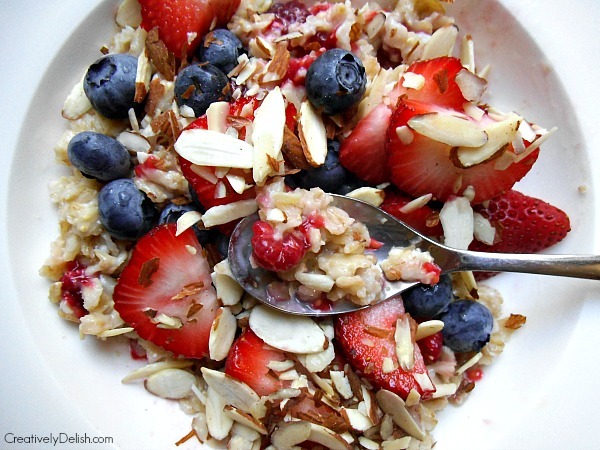 Try this genius oatmeal recipe that's both sweet and savory - all without any added sugars. Usually when I make oatmeal, I tend to add maple syrup, honey or agave to make it sweeter. Although this is a delish way to enjoy oatmeal, that adds anywhere from 60-200 extra calories to your breakfast without you even realizing it! Besides that, there is also very few nutritional benefits that come from those added sugars. So I decided to branch out. Using store-bought berry preserves or jams is just another way of using added sugar, so since it's spring and stores are loaded with fresh fruits, I decided to try making my own little "jam", and it was easy as 1-2-3. 2. 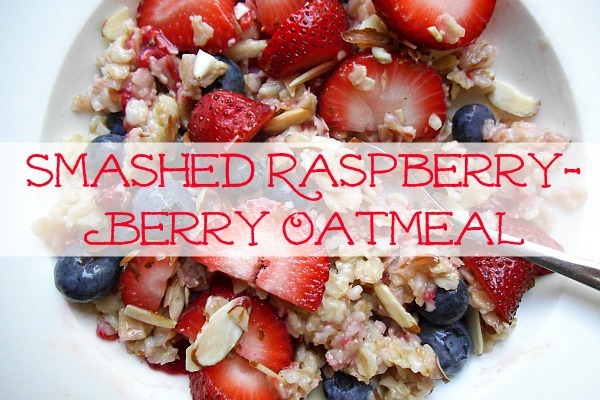 Put the oatmeal in a bowl with the raspberries and smash the berries with your spoon, mixing them in to the oats. 3. Add your other toppings such as sliced almonds (healthy fats), blueberries and sliced strawberries. Voila! A sweet topping to oats that uses no added sugars, only the sugar that nature has provided - and a bonus burst of fiber and vitamins too. My new favorite way to enjoy oatmeal this summer. Yum! Thanks for the link! To be honest, I get excited for the mornings that I can sleep in and have oatmeal on the couch! LOVE oatmeal!